The 5CW2 features independently operating shelves that accommodate a variety of cookware sizes and brands. 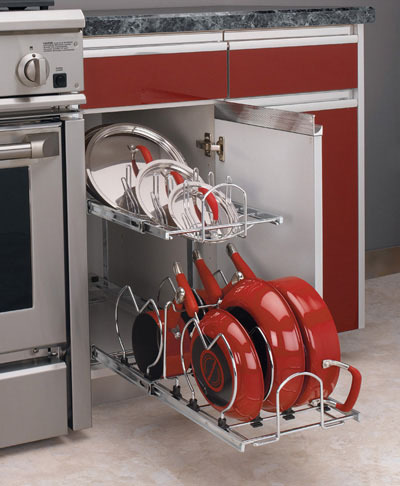 The top tier organizes lids and the bottom tier features adjustable dividers to store a variety of larger pots and pans. 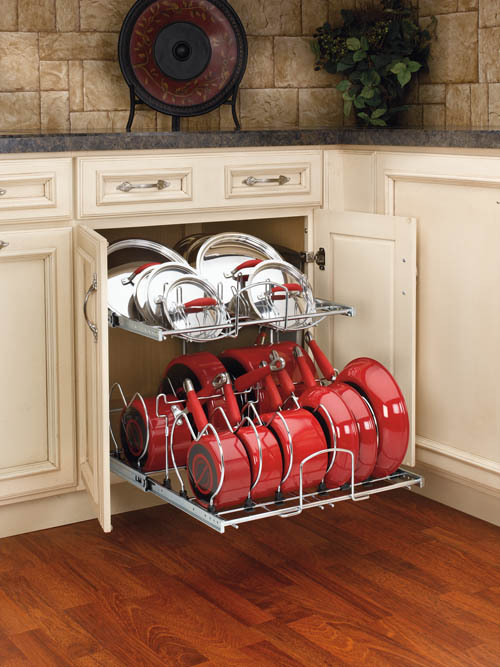 RS5CW2.1222.CR 2 Tier Pot & Pan Organizer Pullout Sm 11-3/4" 22" 18" 15" - 18"
RS5CW2.2122.CR 2 Tier Pot & Pan Organizer Pullout Lg 20-3/4" 22" 18" 24" - 27"
RS5CW2.1222.CR 11-1/2" 22-1/8" 22" 11-7/8" 22-1/4" 18-1/8"
RS5CW2.2122.CR 20-1/2" 22-1/8" 22" 20-7/8" 22-1/4" 18-1/4"